We've been talking about it since we moved in and walked around our very lumpy, uneven, stump and hole-ridden backyard. The stumps had been removed (see "Black Friday") and there was only one thing left to do...rototiller the back forty (or the "Bach Forte" as my Grandparents called it). Here's the before, in all of its lumpy, bumpy, holey (though stump-free) glory. The straw bale garden, which was a mixed success and FUN experiment, had its final harvest the day before and is in a pile along the back fence. And there, in the back, you can see my rented friend, the rototiller. I put on the noise-cancelling headphones and plugged in the Audible app to listen to a Nina Simone biography while I spent a good five hours wrestling that thing around my yard. And here's the yard, post-till. Instead of a lumpy, bumpy, holey mess of weeds, it's a lumpy, bumpy, holey mess of dirt. Ah well, baby steps. After the tilling came the raking and leveling...all done by me with a mudrake. I didn't have to do any deadlifting in the days I was working on this project, that's for sure! Raking and leveling took days. Really, it's an ongoing project, since the dirt is still settling into the depressions that were created when we took the stumps out. So, I'll go out every few days when the ground is dry enough and move dirt around. That section of dialogue from Monty Python and the Holy Grail keeps coming in to my head as I do it. You know the one...with the dirt farmers taking to Arthur about being an autonomous collective and how basing a system of government on "watery binks chucking scimitars" blah blah blah. Anyway, moving dirt around is what I do. Once the final destruction was wrought upon the backyard, it was time to PLANT TREES! Tim and I went to Green Acres and got a couple of flowering plums (my favorites) and a satsuma! So excited! And there's Tim with our freshly-planted trees! We're thinking of adding one to three more small to medium sized trees, but we're going to start with these. Can't wait to see the plums bloom in the spring! Here's a recent shot of the whole backyard, after a few rakings. 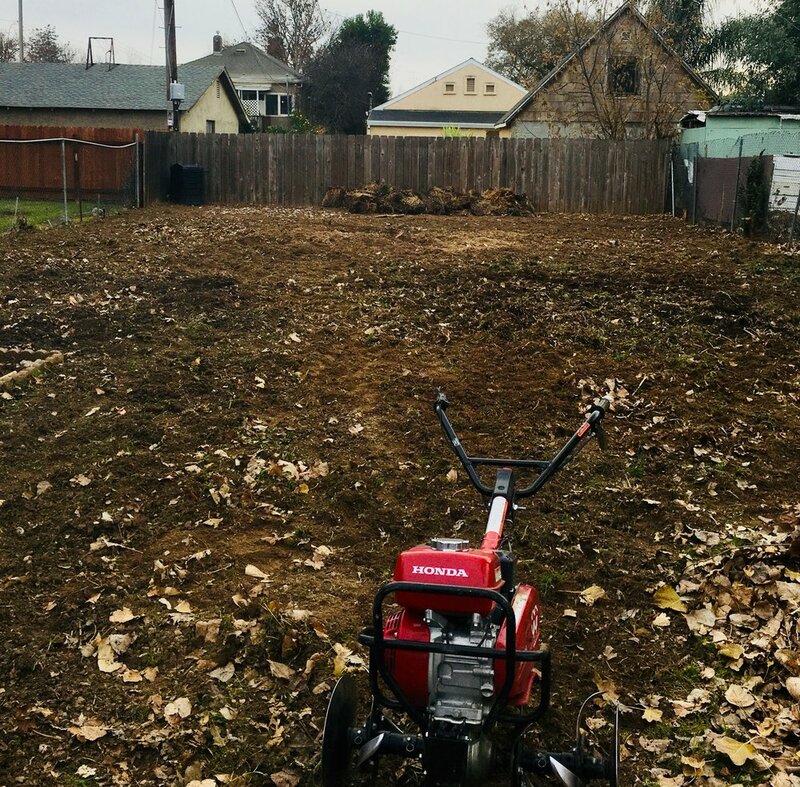 It still looks a lot like a big pile of dirt but, believe it or not, that big pile of dirt is the result of hours and hours and hours and hours and hours of hard work! Not wishing to neglect the front yard, we bought a selection of grasses from Green Acres on that same trip. We planted half of the front to make sure we liked it. Since the answer is yes, we'll head back to Green Acres (love that place) and get enough of the same grasses to do the other side. It's a little sparse right now, but everything will grow up and spread out and I think it's going to look really nice! This was just before everyone came for Christmas, so you can see the tiny ornaments I hung on the twiggy maple. :) I wanted everyone to feel festive!